While gold demand in the West continues to languish, something has recently motivated renewed interest in the yellow precious metal in Germany and the United Kingdom. Now, when I say “renewed interest”, I am referring to a surge in gold investment by Germans and British that we haven’t seen for quite some time. This big increase in gold investment in Germany and the U.K. over the past year and a half is not from the diehard physical bar and coin investors, rather it is from a source that is even more interesting… it’s coming from investors in the retail Gold ETF Market. You see, this is a much different segment of the population who move into the Gold ETF Market versus the 1% that buy physical bar and coins. When there is a surge of Gold ETF buying, it means the institutional or regular mainstream investor is worried about the overall market. And why shouldn’t Europeans be worried as the ECB – European Central Bank’s President, Mario Draghi, stated in June that they would continue its bond buying program (QE – Quantitative Easing) until 2019, even though they believe that the “regions growth” looks broadly balanced. This is like a doctor telling his patient, “we are going to continue with broad-based Chemo-Therapy”, even though your cancer has gone into remission. Unfortunately, most of the public in the European Union doesn’t realize something is seriously wrong if the ECB believes it has to continue printing money to buy bonds… even though the economy seems to be okay. Come one… the economy isn’t okay, it’s a HUGE BALLOON looking for a PIN. This is a big increase for this region because flows into U.S. based Gold ETF’s only increased 6% during the same period. 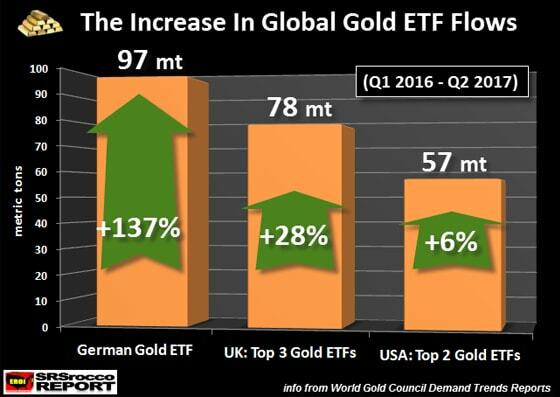 Thus, the percentage increase into European Gold ETF’s was 7 times greater than flows into U.S. Gold ETF’s. 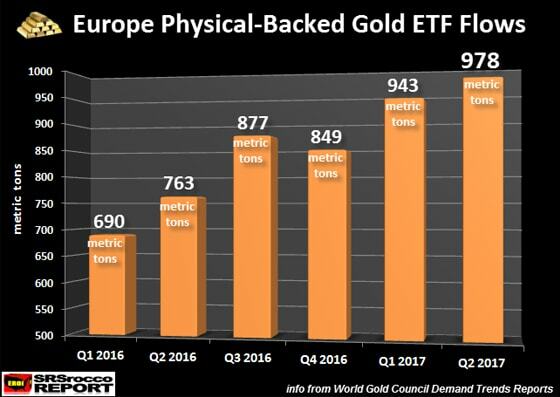 While inventories in European Gold ETF’s declined a bit during Q4 2016, the overall trend continues higher. I believe the decline of gold ETF inventories during the fourth quarter of 2016 may have been due to a decrease in the price of gold in both the Euro and British Pound… but I will get into more details about that in a minute. 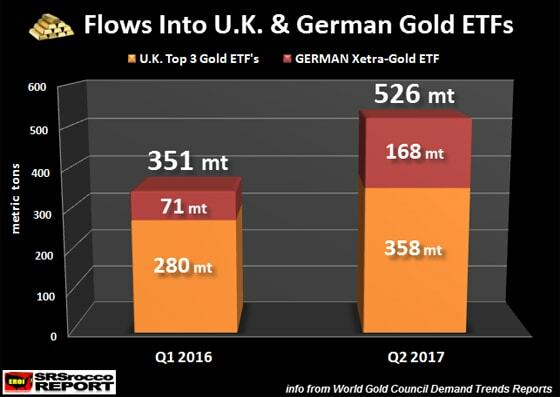 Since the first quarter of 2016, inventories at the German Xetra-Gold ETF jumped 97 mt (137%) compared to 78 mt (28%) in the top three U.K. Gold ETFs and 57 mt (6%) in the top two U.S. Gold ETFs. For whatever reason, institution and retail investors in Germany have moved in the Xetra-Gold ETF in a big way over the past five quarters. 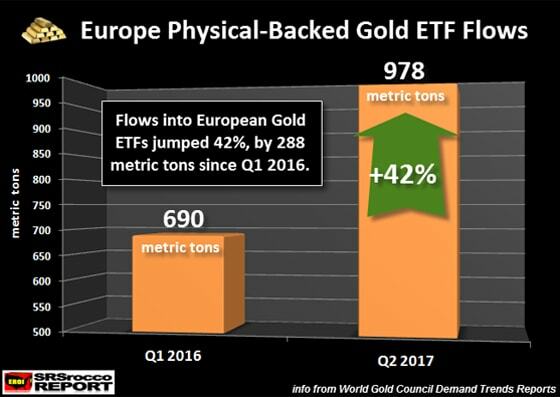 Interestingly, the inventories in the German Xetra-Gold ETF increased 40 mt more than the total of the top two U.S. Gold ETFs and nearly 20 mt more than the top three U.K. Gold ETFs. Here is a table from the World Gold Council Q2 2017 Demand Trends Report. The price of gold in U.S. Dollars and in Euro’s increased 6% since Q1 2016, but the real mover was in the British Pound that saw the gold price jump by 19% from £826.9 Q1 2016 to £981.4 in Q2 2016. The reason for the larger increase in the gold price in British Pound Sterling is likely due to decline the British Pound in reaction to the U.K. leaving the European Union. The British Pound has fallen 10% against the Dollar and 15% against the Euro since Q1 2016. Thus, it is likely that more investors in the U.K. are moving into gold because the British Pound is now trading at lows not seen in 31 years. However, this doesn’t really explain why there is so much interesting in gold in Germany. Again, I am not talking about physical bar and coin demand, rather this is in the institutional and retail investor segment. Actually, I am more interested in the change in the Gold ETF market than I am in the physical gold bar and coin market because 98-99% of investors are in the institutional and retail market. So, when we see a big change in retail and institutional gold demand, then it provides us a real indicator that something is seriously wrong in the overall market. Germany is the largest economic power in the European Union and I believe the citizens are not only worried about the disaster that the ECB is doing with all the massive money printing and bond purchases, but there are serious geopolitical concerns now with Russia, by the instigation of the U.S. Government. With the new Russian Sanctions voted nearly unanimously by both the Senate and Congress, we may now begin to see a huge rift between the German and U.S. foreign policy. The new Russian sanctions will target any company that assists or contributes to the development or maintenance of Russian export pipelines. Currently, German interests are working with the Russians on a new natural gas pipeline project called Nord Stream 2. Germany imports 40% of its natural gas (2016 figure) and 35% of its oil (2014 figure) from Russia. So, for the U.S. Senate and Congress to pass Russian sanctions that will impact Germany, who receive more than one-third of their energy from Russia, will likely cause increased political tensions between U.S. and Germany. Of course, the Germans need the energy for their economy, so I doubt they will abide by the new U.S. sanctions against Russia. Unfortunately, the Senate and Congress controlled U.S. Government may have finally overstepped their bounds by meddling too much in the European Union economy as Germany will likely continue to increase business relations with Russia. Furthermore, the German Government is probably taking note how Russia continues to add to its official gold reserves as they realize the U.S. Dollar global reserve status is coming to an end. With geopolitical tensions increasing in the European Union, along with the insane QE monetary policy by the ECB, Germans may finally be waking up to the fact that “GOLD is the king of currencies” as well as a high-quality store of value. I believe we are going to see a great deal of volatility in the markets when the U.S. Government debt ceiling deadline causes a possible default in early October. This along with the CIRCUS now taking place in Washington DC, investors who haven’t purchased any physical gold and silver, need to seriously consider doing so before the FAN hits the COW EXCREMENT.